Members of the No-ARC21 campaign group. 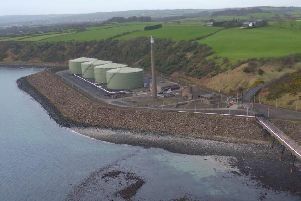 Community group NoArc21, established to oppose arc21’s waste incinerator at Mallusk, have outlined their disappointment at the decision by the Department for Infrastructure to grant planning permission for the proposal. The position taken by the Department, which follows a two-day PAC Hearing in October 2016, represents a reversal of a previous planning decision against an incinerator in the area. The group are currently considering the legal options open to them. Colin Buick, Chairperson of NoArc21, said: “Naturally our group are extremely disappointed by the news that the Department has decided to grant approval for the arc21 waste incinerator at Mallusk. “We have fought against this project for many years and those living in the communities who will be affected by this fundamentally flawed proposal will be rightly disgusted at the decision. This, he continued, includes concerns around environmental and health impacts and increases in heavy traffic. NOARC21 has arranged a public meeting on September 28 at 8pm in the Academy and Community Hub to discuss the Department’s decision.